Shots Ezine are delighted to offer lucky readers an opportunity to enter the Titan / Hardcase Crime Joyland Carnival Competition. 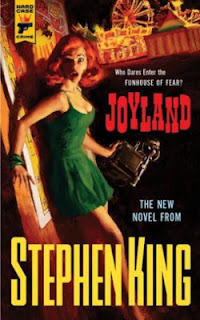 Best-selling author Stephen King returns with a breathtaking tale of love – and loss – set in a 1970s North Carolina amusement park. Celebrating the release of this bittersweet coming-of-age novel, Titan Books and Hard Case Crime are teaming up with a series of digital partners to host competitions to win a free copies of Joyland and a limited run of EXCLUSIVE JOYLAND canvas prints of Glen Orbik’s cover painting. 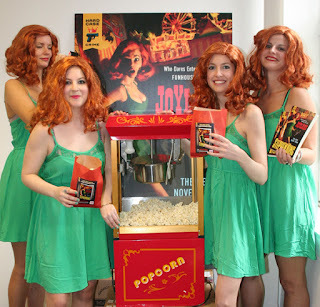 Who dares enter the world of JOYLAND to win these unique prizes? Playing the game is simple. Follow the carnival as it tours across websites… Each website will post a definition of carny “Talk” or Stephen King trivia everyday for three weeks. Step right up! Step right up! Talk “the Talk” @Titan Books!